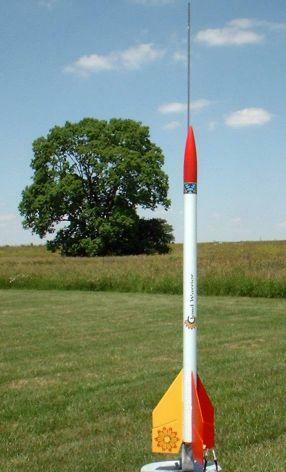 Essence's Model Rocketry Reviews (EMRR) is happy to introduce a new "virtual" rocket contest. The theme for this contest is NASROC. Dionne Vennard's Level 1 "NASROC"
In this contest you will be provided two rockets, one low power and one mid/high power, from our list of approved NASROC's. These will be provided to you randomly. Your job will be to "improve" upon the design of the rocket as long as you don't change the exterior dimensions (length and diameter), shapes (fins and nose cone), quantity of fins, and the other requirements noted below. You will also be allowed to submit your very own "rocket of the future" to show what you are able to do without NASROC's restrictions (although there will be a couple). You will then compete with approved motors in a number of events. To get started, simply send me an e-mail to get your two stock rocket RockSIM's. This is a PERFECT contest to go after the Build Bonus! Participating in this contest counts toward the 2007 EMRR Challenge. Entries must be received by 7/13/2007. All motors contained in this file are valid. (01-09-2007: Every Certified Rocket Motor (NAR/CAR/TRA)). It is not necessary to fill all motor tubes for each event (although 1 motor is required). Select the rocket part colors and decals that your would like to see posted (Think NASCAR). Scoring will be weighted so that the provided designs are 40% each of your score and the "Rocket of the Future" will be 20%. Time Trials & Control: each of your (3) three rockets will fly to establish poll position. The fast time to 1000 ft will be combined with the slowest speed at ejection to establish a score for this event. The top 10 will receive a Time Trial Bonus (TT) with 1st place receiving 1.0, 2nd receiving 0.9 and so on that will be applied to the total points at the end. Straight-away Speed: each of your (3) three rockets will demonstrate their maximum speed (velocity)... safely. 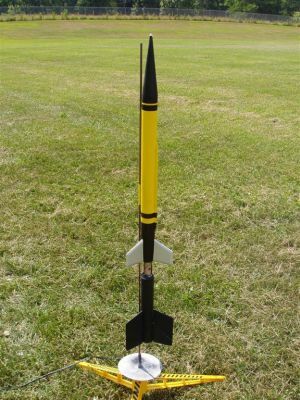 1/2 Mile Track with Restrictor Plate: each of your (3) three rockets will fly to as close to 1/2 mile (2640 ft) as possible without going over -and- without exceeding 400 ft/sec maximum velocity. Pit Stop: The score for this event will be based on a combined ranking from each of these categories. DQ Condition: The bottom stage must clear the tower, and the upper stage must reach at least 50 feet altitude to qualify. Sponsor-Appeal: choose (1) one of the (2) two provided rockets as your team's show piece. This one will be voted on to determine the best looking and most creative finish combination. The objective is to follow the theme of the contest and draw the attention of sponsors and fans! Lap Bonus: There are 24 laps, or rather, 24 opportunities to be best at an event or component of an event. For example in Event #1 there is Fastest to 1000 ft and Slowest Ejection. That is two components of an event times (x) three rockets equals (=) six laps. The lap leader will enjoy a 1.0 point bonus, 2nd will receive 0.9, etc. until 0.0 points or until there is an entrant with zero leading laps. Precision. You aren't going to believe this. Seasoned vetnin here and he showed it. The most amazing was in the 1/2 Miler coming within 0.04 feet of the exact mark. Then came in at 0.07 of the 50 foot mark in the Pit Stop. Used an interesting technique in the Last Lap though and actually angled with the wind. Love the lines and the techniques of an experienced "virtual" flyer. Excellent flyer having the lead in the race 7 times with a "good looking" rocket and excellent control in the Last Lap staying tightly in the lines (range). Holy Cow!..was my first reation on Andy's 2-stage. Here we saw some real performance waves, especially in this Dr. Pepper model... popping off of pad in 0.044 seconds for the last lap. That was 30% faster than any other rocket. Truely this rocket was untouchable for speed! How cool is that!? Thanks for capturing the theme. An upper 2/3rds flier with the best-looking, themed rocket out there. When the sponsors he'll get for the next contest, he ought to be able to tweak his performance a bit more. Came within 3 tenths of taking 3rd place. Even though this one came in at the last minute there were a few shining moments. Fast Pit Stop around with 4.276 seconds. Also, while doing his Rocket of the Future Time Trial, showed that he could compete with the best of them. You turned this around in like 3-days... you need to compete more often. What can we say? Rookie of the event! Okay, that's fair. Let's see what you can do next time. Send me a request... easiest way is the feedback button on the top horizontal menu!